Budj Bim and Lake Condah are part of traditional Gunditjmara country. The people who lived at and had specific responsibility for Lake Condah are the Kerrup-Jmara (people of the water / lake). The Budj Bim National Heritage Landscape is a nationally significant and unique landscape whose values (natural and cultural) are inextricably bound with the Gunditjmara people. For the Gunditjmara, many of the cultural systems and connections with the landscape are directly tied to the unique natural values of the landscape. The story of the Gunditjmara and Budj Bim is remarkable for the continuity of attachment to the area that Gunditjmara have maintained in spite of repeated attempts at dispossession. This case study illustrates the application of the Victoria’s Framework of Historical Themes to a complex cultural landscape by drawing on just six of many storylines associated with the Lake Condah and Budj Bim National Heritage Landscape. The result is a structure that represents the complexity of the place, and reveals several recurrent themes. Relevant to local, state and national stories, the recurring themes show the linkages between stories and their continuity over time. Budj Bim is part of the ‘Eccles’ Volcanic landform, geologically known as the Tyrendarra Flow, formed as a result of the explosion of Mt Eccles approximately 27,000 – 30,000 years ago. 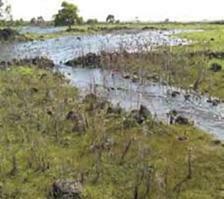 The eruption substantially altered the landscape, resulting in the formation of alluvial wetlands and ‘stony rises’ that characterise the environment today. Lake Condah itself was probably formed about 8,000 years ago. Gunditjmara witnessed the explosion of Eccles and knew it to be the revelation of an important creation ancestor. The Gunditjmara word for Eccles is Budj Bim, ‘High Head’. Mt Napier is the other part of the Ancestor’s head and the landforms associated with both mountains comprise the Ancestor. Lake Condah and the Budj Bim National Heritage Landscape is a place of encounters, a place of frontier conflict and a place of defending country. The inaccessible country of the stony rises provided a base for the Gunditjmara and other western clans in launching a sustained attack against settlers throughout the 1840s, the hostilities eventually named the ‘Eumeralla Wars’. The stony rises offer an example of Aboriginal use of the environment in response to European invasion. The terrain of the Tyrendarra Lava Flow allowed the survival of unique indigenous cultural values. The Gunditjmara have lived on, and subsequently retained cultural ties with this place for millennia. Lake Condah is rich in places, stories and objects that represent this storyline, including the system of ponds, wetland ecosystem, channels, weirs, fish traps and eel baskets. Traditionally, female Aboriginal elders wove eel baskets to harvest mature eels. These objects, still woven today, provide tangible evidence of the continuity of Gunditjmara culture and traditions, despite these activities and the passing on of traditions being actively discouraged at the Mission. The Lake Condah Mission site is set within the traditional lands of the Kerrup Jmara people, on one of many of their traditional camping places. The Mission was established at Lake Condah in response to preceding years of resistance by local Gunditjmara from Portland and Condah to being moved off their country to the Purnim mission (now Framlingham). In 1866, 827 hectares were set aside as an Aboriginal Reserve, and a Mission opened in 1867. In 1885, additional land was set aside to safeguard traditional hunting grounds. However, the Mission was later closed and in 1896 the Reserve was revoked and frontage to both the Lake and a large area of stony country removed. The Mission was formally closed in 1918, and Aboriginal people were forced off the Mission, some moving to Lake Tyers. The Gunditjmara protested against the Mission’s closure and many continued to reside in the buildings until the majority of the reserve land was handed over to the Soldier Settlement Scheme in the 1940s. Land was not made available to local Aboriginal returned soldiers, heralding the continuation of Gunditjmara struggles for inclusion in the political process and for the right to continue to occupy their traditional country. In addition, the 1968 Half Caste Act banned Aboriginal people with mixed heritage from living on Aboriginal missions. Despite government attempts to move them, Gunditjmara continued to use the Mission until the 1950s, when the church and houses were destroyed so that they could no longer be used. Despite the loss of much of the Mission, Gunditjmara continue to live in the area and to protect their heritage. The Mission lands were returned to the Gunditjmara in 1987. Approximately 10km from Portland, at Allestree, is the Convincing Ground, a coastal site where Edward Henty established one of Victoria’s first whaling stations in the 1830s. The settlement that grew around the Portland Bay area displaced a number of Gunditjmara clans from their traditional country. The Convincing Ground has social values for association with traditional country, its defence from European settlers, and the loss of lives in violent conflict. Reports from the 1840s identify the site as a place of violent conflict between large numbers of local Aborigines, whalers and settlers. The numbers of Aboriginal people that died is unknown, but contemporary reports say the conflict was violent, resulting in deaths of members of the Kilcarer gundidj clan. The name is said to come from the fact that the conflicts at this place ‘convinced’ the Aboriginal people that the white settlers could not be beaten or expelled. Soldier settlement schemes were set up in many parts of Victoria (and Australia), including at Lake Condah. The Aboriginal land at Lake Condah allotted to soldiers returning from the Second World War has local significance for those people who lived on and farmed their allocated portion of the Lake Condah landscape. Land was not granted to Aboriginal returning soldiers, and Aboriginal people were disconnected from a place that was carved up into small farmlets and allocated to returning soldiers. One local Gunditjmara man not included in the soldier settlement grants, in spite of contesting his exclusion from the scheme through proper channels, was decorated returned soldier Harry Saunders.